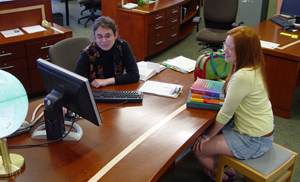 The MU Libraries provides many ways students can receive library help. Walk-in library assistance is available at the Ellis Library Reference Desk and at most branch libraries during daytime and many evening hours. Communicate with library staff directly via email, chat or phone by clicking on any “Ask MU Libraries” link. Finally, a special librarian liaison is designated for international students. Contact Cindy Cotner for special assistance, or to get a referral to the specific subject specialist for your academic discipline.